Wondering what Google’s G Suite for Education is all about? You may have heard that Google offers their G Suite product (formerly known as Google Apps) free to education. Businesses pay a minimum of $5 per user per month to access G Suite, but eligible education institutions around the world can access the suite of tools for free. Many of the tools and features of a G Suite account are also available in consumer (personal) Google account (e.g. a Gmail account). 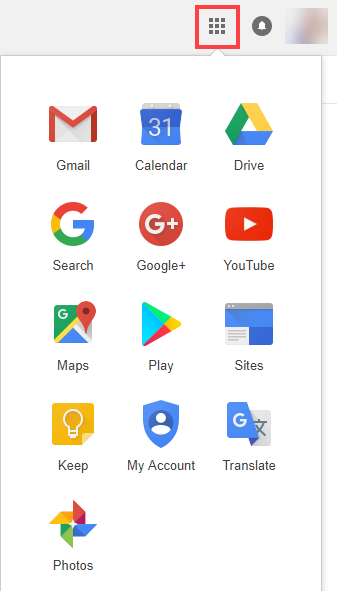 If you have a consumer Google account and want to check them out, click on the Apps Launcher button and start exploring. You might want to select the Google Drive icon and then use the Create button to start a new Google Doc, Sheet, Slide, Form or Drawing. So what’s the difference between a G Suite for Education account and a personal Google account? When a school signs-up for G Suite for Education, they get their own G Suite domain which reflects their school’s domain name (e.g. yourschool.edu). Within this environment, your IT department creates and manages G Suite accounts. Each student, teacher and administrator can be given an account that has the school’s email address (eg firstname.lastname@yourschool.com), rather than @gmail.com. Each account has unlimited storage for emails and files. G Suite domains have access to additional tools and enhanced security features. Your domain administrator can also choose what Google tools staff and students can access and configure settings to suit the needs of your school. For example, you can also choose to have more relaxed sharing settings for teachers and older students and tighter settings for young students. Importantly, when your school signs up for a G Suite domain they enter into a contractual agreement with Google – instead of the individual teachers and students (as they do with a consumer Google account). This means that the usual 13+ years age limit for consumer Google accounts does not apply. You can provide G Suite for Education accounts to younger students too! G Suite accounts also have no advertising and you receive 24/7 support from Google. Why are schools using G Suite for Education? Here’s some of the benefits of using G Suite for Education at your school. 1. You can save thousands of dollars on maintaining email and file servers. Google can host all of your email and files so you don’t need to worry about maintaining email and file servers. This is a real winner. Your students can be working on the same document at the same time. Each student can have their own workspace. This is fantastic for group work as it eliminates the problem of one student doing all the work while all the others watch on. Depending on your security settings, you can also allow your students to collaborate with other students outside of your school. I love watching students collaborate with each other from across the globe in a secure way! Many of your students are already familiar with and using Google tools and services. Rather than driving students to tools they wouldn’t normally use, you can offer them school-based accounts for the ones they are already using. A G Suite account gives you access to the full spectrum of Google tools, with the ability to enable or disable them to suit the need of your school and students. Unchaining IT support staff from maintaining email and file servers gives them more time to help your teaching staff. They are able to sort out technical issues, answer questions and make sure the lessons flow smoothly. G Suite for Education is easy to set up. There is no software or hardware needed. Once you have your domain established and configured, your IT staff can just keep things ticking over. The hardest thing they will have to deal with is helping students who have forgotten their password. G Suite for Education has a proven track record. It is used globally by millions of schools and universities. There are an increasing number of major multinational and small businesses using G Suite. Exposing your students to modern communication and collaboration tools prepares them for working this way in the future. Google invest significantly in ensuring their products and your data are secure. Their security and protection is far better than what most (or all) schools can provide with their on-site infrastructure. A G Suite for Education domain includes 24/7 support from Google. A G Suite account allows you to access your data (emails, files etc.) from anywhere in the world. There is no need to email yourself documents, save your work to thumb drives, persist with Moodle or any of the other frustrating work arounds you have developed. Simply log into your account and everything is there for you. In addition to this, your students can share their documents with you. No more pets eating homework, computers crashing and printers running out of ink. This really is a great solution for both teachers and students! If you would like some advice on how you can implement G Suite for Education in your school, simply contact us. Using Technology Better is a Google for Education Professional Development Partner. You can be assured you will get expert advice from teachers who understands the needs of a school environment.